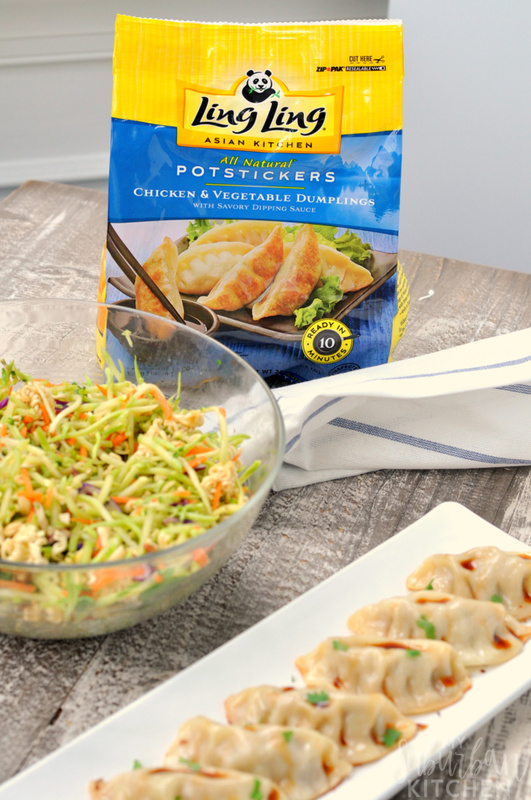 Skip the take out menu and have a delicious meal featuring Asian broccoli slaw salad and Ling Ling Potstickers. In just 20 minutes, you can have a great meal for your family to enjoy for Chinese New Year or any night of the week. We love Asian inspired recipes and frequently turn to the take out menu on busy nights. 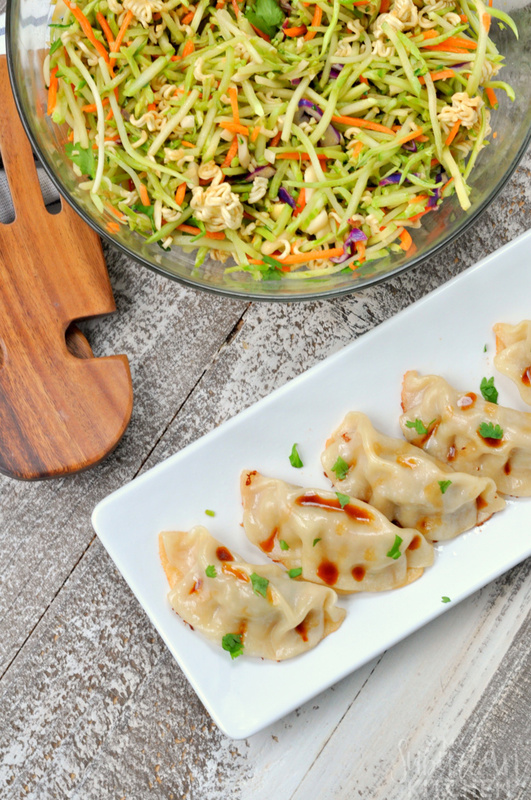 With Ling Ling Potstickers and this Asian broccoli slaw recipe, I can easily toss that take out menu and still get my family a delicious dinner on the table. All three varities of Ling Ling Potstickers comes with a delicious, signature dipping sauce too. Plus, their ingredients are always high quality and include things like freshly sourced vegetables. They are so perfect for a family meal or to make as part of your Chinese New Year celebration. 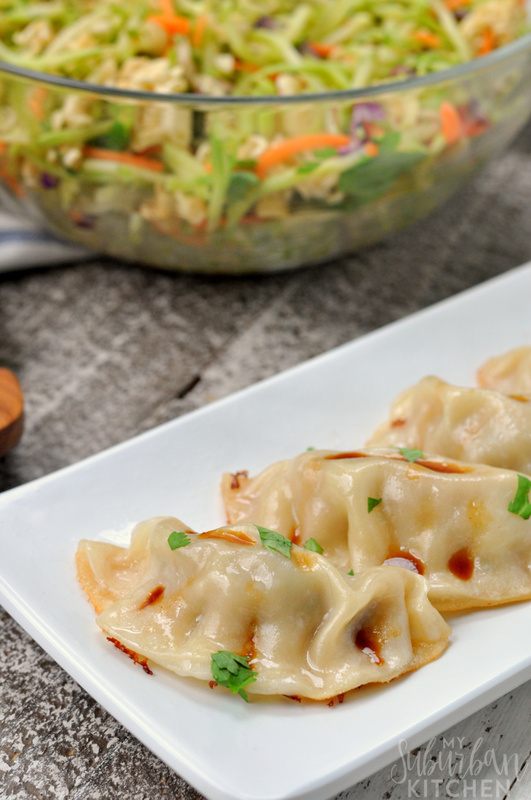 I like to pair the Ling Ling Pork & Vegetable Potstickers with a ramen noodle slaw. 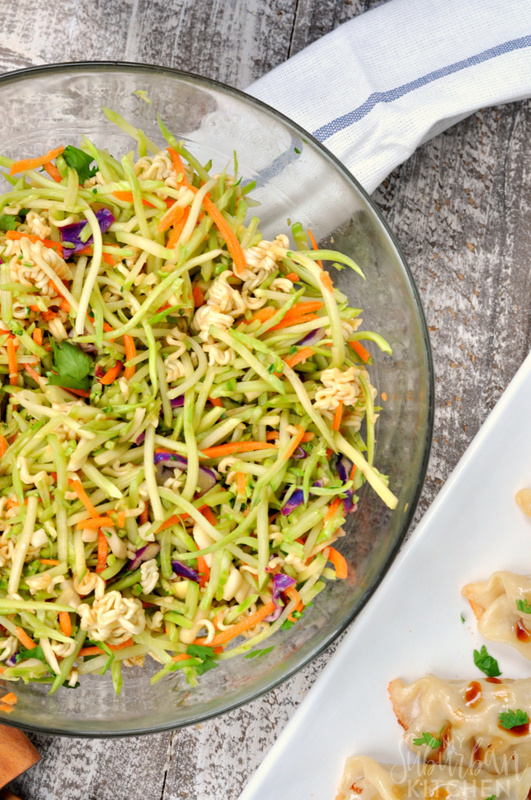 Our favorite version is this broccoli slaw salad which combines broccoli slaw with an Asian inspired dressing for a delicious, crunchy companion to the potstickers. 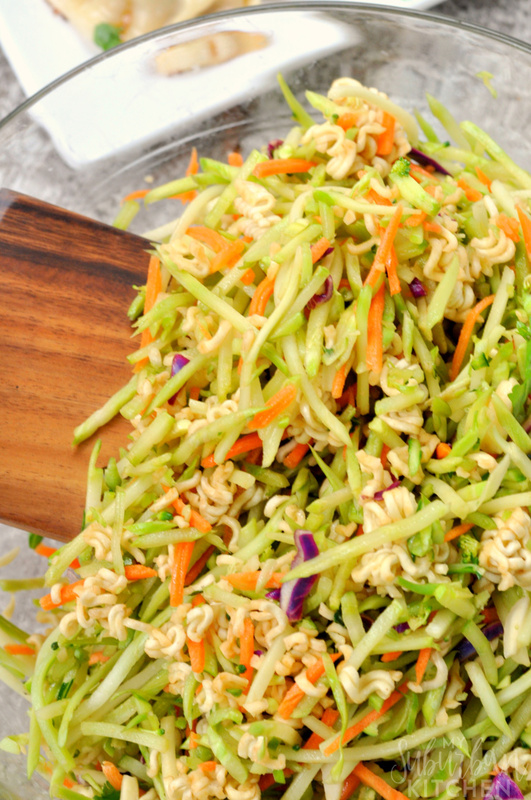 You can also make a classic Asian slaw salad using coleslaw versus broccoli slaw if you prefer. This recipe is my favorite. I love the extra crunch that the broccoli slaw gives though. 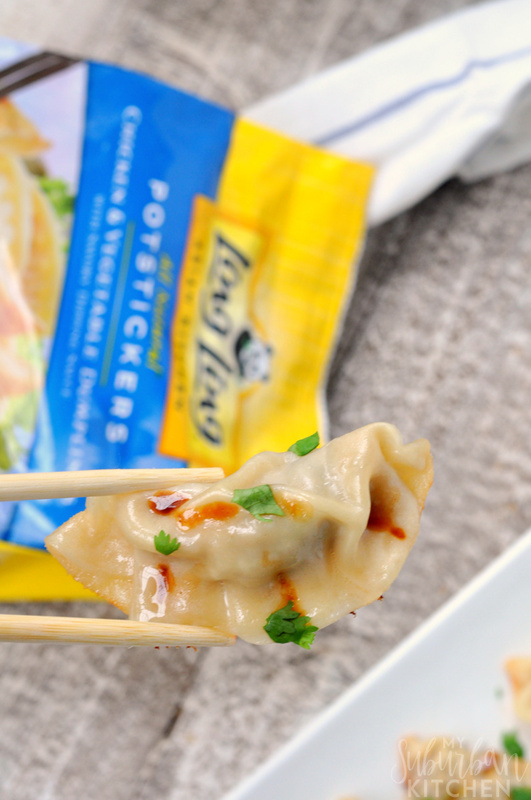 If you love Asian inspired dishes, you definitely need to try Ling Ling Potstickers. They are so perfect for easy weeknight meals or to serve at celebrations like Chinese New Year. You can visit them on Facebook, Instagram, and Twitter for more information about their products and recipe ideas. If you try this Asian broccoli slaw recipe or any other recipe from the blog, I would love to hear about your experience. Let me know in the comments or snap a photo and tag it #MySuburbanKitchen on Instagram and Twitter. Asian broccoli slaw is a gret combination of broccoli slaw, ramen noodles and an Asian inspired dressing. Break ramen noodles into small pieces. Set powder aside. In a large bowl, combine broccoli slaw, ramen noodle pieces, almonds, and cilantro. In a small bowl, combine rice vinegar, packet from ramen package, sesame oil, garlic, and soy sauce. Whisk to combine. Add dressing to broccoli slaw and toss to combine. Refrigerate for 15 minutes or until ready to serve. Nice change from cabbage to broccoli and adding ramen crunchiness. My family will love this salad. I would have never thought to add raw ramen noodles to a salad, but this came out so good! It’s a great side dish to go with those potstickers, or any other asian main dish like sesame chicken.